Owning a dental practice is a daunting process. There are so many things to think about as a dentist that your website is quite possibly the last thing on your mind. However, this is one area that if not taken care of by qualified professional correctly; it will do more harm than good to the practice. We have to come to an understanding that times change. When you went to college to become a dentist there was no mention of the website and marketing being an integral part of your success. Websites and blogging as well as social media probably never crossed your mind as something a dental office would do. In fact, in our experience many doctors and dentists don’t even have a Facebook account. The common trend is they don’t have time for it and they don’t feel it to be secure. It is our mission here to challenge you to think differently and learn what digital marketing can do for a dental practice. We feel that we need to explain just how important Google is to your dental practice. In fact, Google is that important to any business that wants to compete well and have a healthy amount leads and customers coming in month after month. 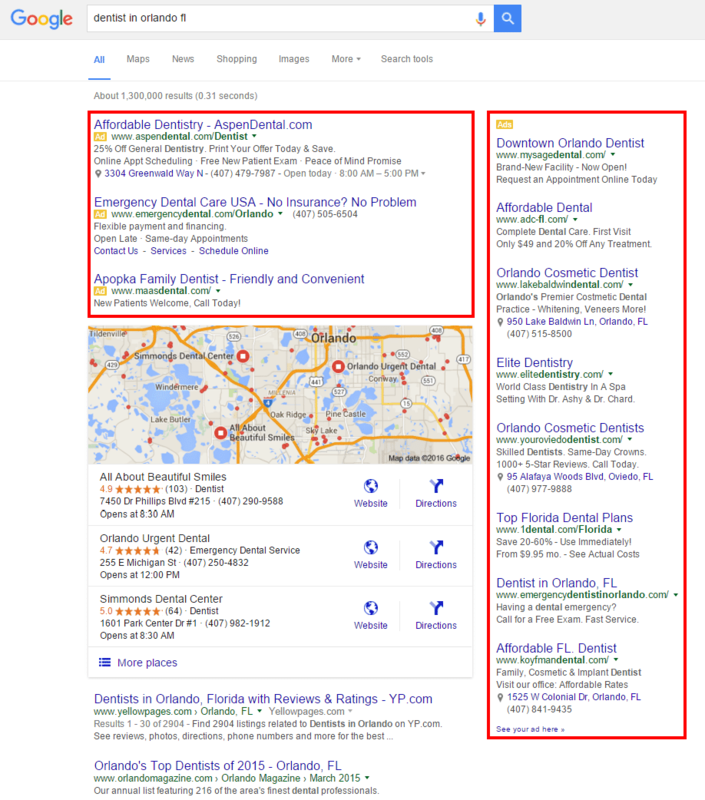 As a health-care digital marketing agency we found that over 40% of the calls dentists receive are from local searchers on Google and that is where the concentration of your practice needs to be. Your practice is your business and you need to occupy as much search results as you can when someone searches for your practice. Here, we will begin at the most effective way to get to the top page with your dental practice. Paying for the ads can cost you an arm and a leg if you don’t hire the right agency to manage this for you. Even though it costs to pay but there is a significant return on investment on Paying for Ads, and with Google Adwords, you can get in front of your ideal customers for keywords they are searching for. The secret to pay per click ads is to have them so well-targeted that you avoid the stray clicks that are draining your pocket. Pay per Click is when businesses like yours pay Google to display their website link in the search. Here is a screen shot of the difference between a paid ad and a link in regular search. The results marked in the red box that shows up at the top and sidebar are the ones that are paid and get the first and most clicks. You want to be in that box above the organic map and regular results that appear below these ads. 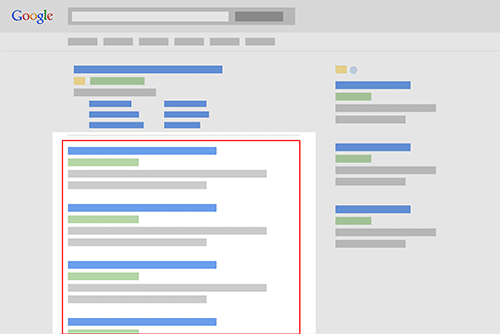 This is the first and fastest way to start showing up on Page One of Google for keywords that are related to your business and services e.g. Invisalign Braces, Dentist in Orlando, FL, Dental Implant Surgery Orlando etc. For Dentists who are practicing within a defined geographical area, Local Maps search results are a lifeline for their business. As you can see in the example where below the paid ads, three dentists show up and one can say without a doubt that they are getting a healthy number of patients. Getting in that prime spot is no child’s play and can take months before your listing can bypass dozens of your competitors but that is where a digital marketing like us comes into play and help you out. With that being said, Local Map Listings is another way you can secure and occupy a spot to get more exposure for your practice. Organic SEO is a great way to have a more permanent listing that won’t cost money. You don’t have to keep paying for Organic SEO. The process of organic SEO is evergreen and like the roots of a tree stay firmly placed in the soil that will grow your business. It is recognized and ranked as a genuine business with something valuable to give to the search result. 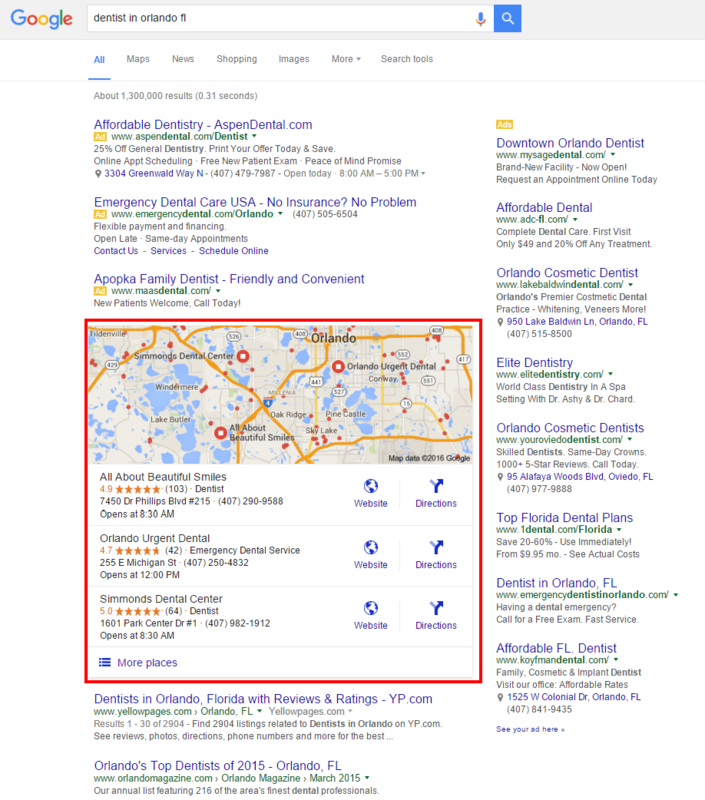 As seen in the illustration below, the organic or natural search results appear after the paid ads and local maps results for specific keywords that include city name but organic results are which people mostly look for and as a business, getting on page one for lucrative keywords like dental implant surgery can yield high paying patients and cases for your practice. Google’s love affair with organic SEO is justified because it’s the best process to ensure the businesses that people use Google to search for are the highest quality ones. This means it take a bit longer than Pay per Click ads. But, the long-term steady as a rock hold you have on the first page is valuable. Do you know that your practice’s social media profiles also ranks on Google and is one other way to secure a search result place for your business name and is invaluable. This is because when a potential patient searches for dentists in your area or pops in your name there will be more and more platforms that they can engage with you on. For example, your website will come up and then the Facebook account and after a while your other social media profiles will start ranking well. In no time at all, when a prospect searches for you; Google will show several networks they can click through on and engage your practice and once you have them all set up efficiently, those same people will provide you their information in exchange for whatever giveaway you have on those social media accounts. See how it works so smoothly and in tandem? This can be done weekly at first then twice a month, then once a month. It depends on the research your digital marketing agency does. The press release is sent to dozens of content distributors that can shoot you to the top. The press release could be about a new technology or procedure. Something unique to your office. 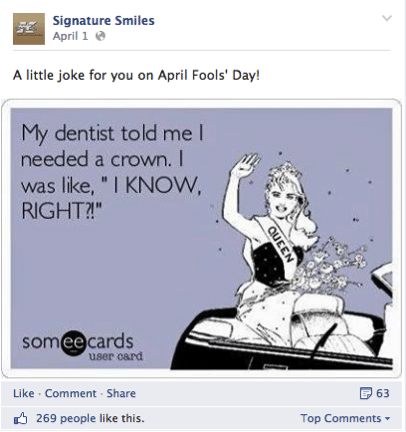 Or, like in the example below you can specialize in talking about a trending hot topic in dentistry. 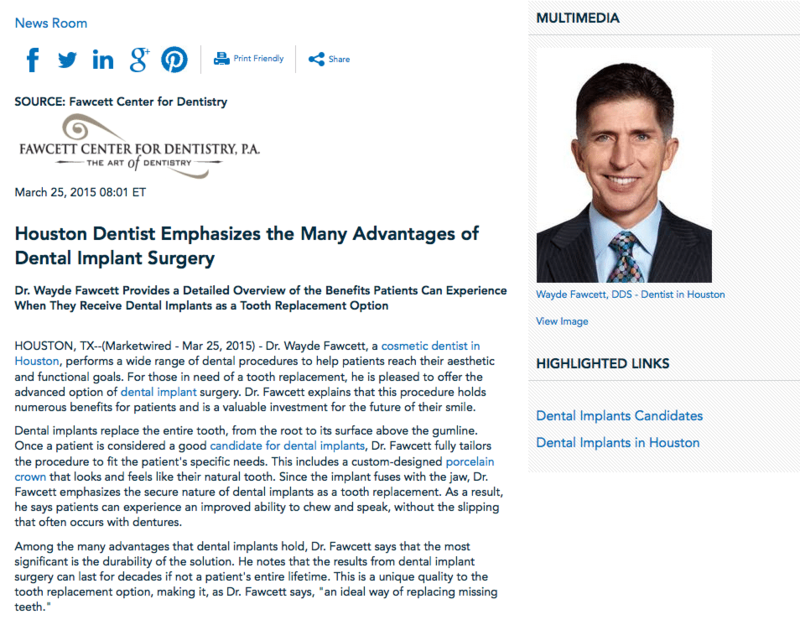 In this case, it was about the the many advantages of dental implant surgery. This is how it actually works and it’s a really exciting thing that Google does. It gives you an easy way to occupy yet another listing. When Google lists your press release they will publish a snippet of it so that you’ll be seen and your hot topic will be seen next to your name and picture or your social media profiles, Yelp reviews and more! Yelp reviews are a powerful tool across the board. Yelp isn’t just a place for people to either praise or disparage. It’s a very high-ranking platform that has people looking for good dentists. That dentist may as well be you. 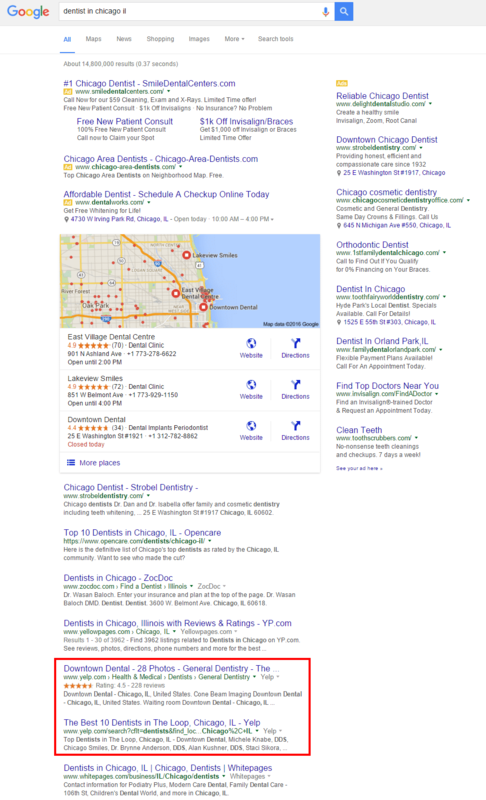 We’ve searched Dentist in Chicago Il to Dentist in Orlando fl and in these searches there are yelp listings of top dentist practice and another listing of all the dentists in Chicago that is then sorted by reviews. The first benefit is people get to see your review in search along with all your other social media and your website. The second benefit is you’ll be right there when people are searching Yelp for good dentists and will be most likely to show up first. Why, because we will ensure you are right there in organic local search. Yelp is a strong way to also provide organic backlinks to your website and social media. All of your information is right there along with your review. Backlinks are simply SEO that is off your website. It means that there is an outside element apart from what is on the website that is generating leads to it and your practice. 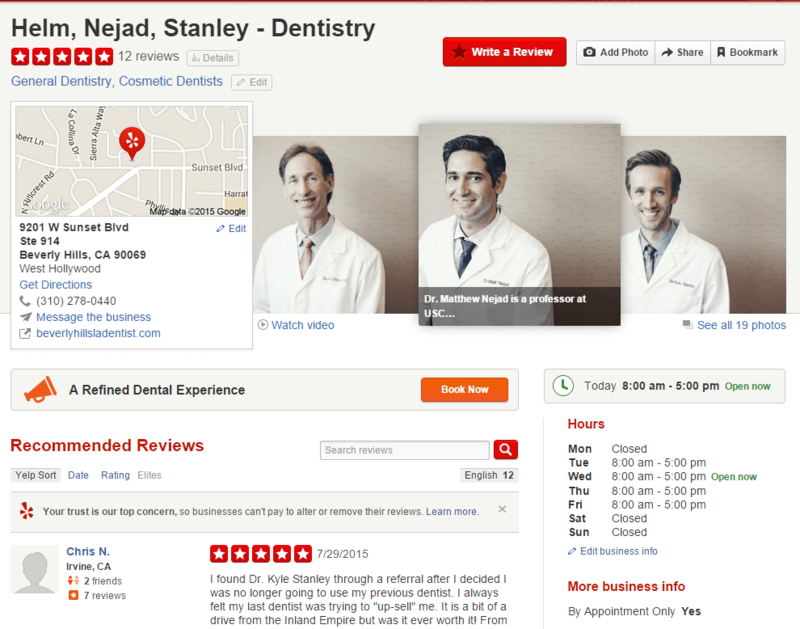 As you can see that listing your practice on Yelp can do great things for your business in terms of reputation management and also give you an opportunity to rank that listing page on Google so you can dominate the most desired “Page One of Google“. Contact us today for a free consultation on your practice and how we can help you.